Destroyed motorcycles and bicycles outside the church. AFP photo. Suicide bombings struck churches in a major Indonesian city during Sunday services, killing at least 11 people and wounding dozens in attacks which police said were carried out by a single family including two young girls. The bombings at three churches in Surabaya — claimed by the Islamic State group — were the deadliest in years, as the world’s biggest Muslim-majority country grapples with homegrown militancy and rising intolerance towards religious minorities. The bombers — a mother and father, two daughters aged nine and 12, and two sons aged 16 and 18 — were linked to local extremist network Jamaah Ansharut Daulah (JAD) which supports IS, said national police chief Tito Karnavian. The mother, identified as Puji Kuswati, and her two daughters were wearing niqab face veils and had bombs strapped to their waists as they entered the grounds of the Kristen Indonesia Diponegoro Church and blew themselves up, he said. 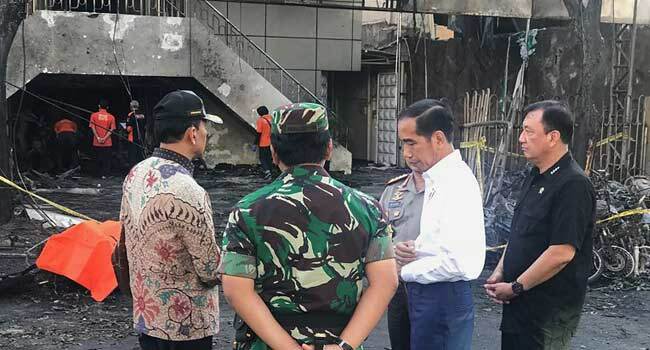 The father, JAD cell leader Dita Priyanto, drove a bomb-laden car into the Surabaya Centre Pentecostal Church while his sons rode motorcyles into Santa Maria church, where they detonated explosives they were carrying, Karnavian said. “All were suicide attacks but the types of bombs are different,” he told reporters. The group, led by jailed radical Aman Abdurrahman, has been linked to several deadly incidents, including a 2016 gun and suicide attack in the capital Jakarta that left four attackers and four civilians dead. Police on Sunday said four suspected JAD members had been killed in a shootout during raids linked to the deadly prison riot this week. Five members of Indonesia’s elite anti-terrorism squad and a prisoner were killed in clashes that saw Islamist inmates take a guard hostage at a high-security jail on the outskirts of Jakarta. IS also claimed responsibility. 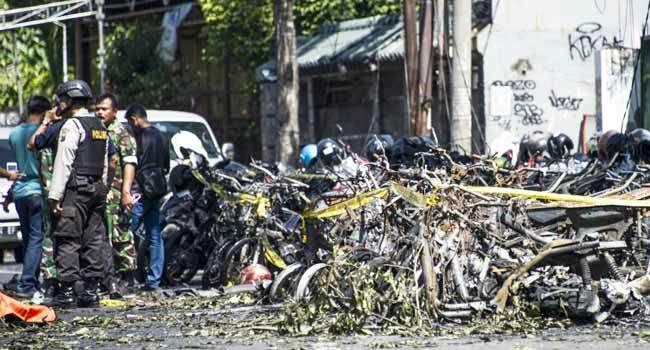 East Java police spokesman Frans Barung Mangera confirmed the deaths of 11 people with 41 injured in the coordinated attacks at around 7:30 am (0030 GMT). Nearly 90 percent of Indonesia’s 260 million people are Muslim, but there are significant numbers of Christians, Hindus and Buddhists. Police shot and wounded an IS-inspired radical who attacked a church congregation outside Indonesia’s cultural capital Yogyakarta with a sword during a Sunday mass in February. Four people were injured. The archipelago nation of some 17,000 islands has long struggled with Islamic militancy, including the 2002 Bali bombings that killed 202 people — mostly foreign tourists — in the country’s worst-ever terror attack.